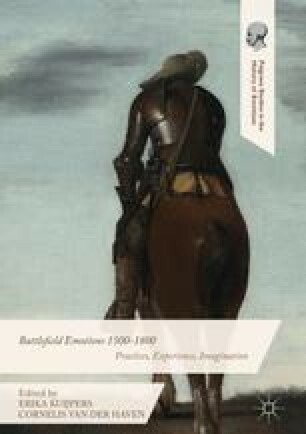 DeBoer considers two bodies of imagery relevant to an investigation of battlefield emotions in the early modern Dutch Republic: the large number of siege maps which advertised the successes of the Dutch army, and a singular group of paintings of soldiers by Gerard ter Borch. Siege maps bound soldier and citizen together in an emotional regime animated by the apparently orderly, rational and successful military defence of the nation. Ter Borch’s soldiers, on the other hand, provide an unusual but no less informative image of the soldier as an individual—a person imbued with subjective, emotional experience. Together, siege maps and ter Borch’s soldiers reveal the production and negotiation of emotional social norms in relation to the emotional experience of the soldier.